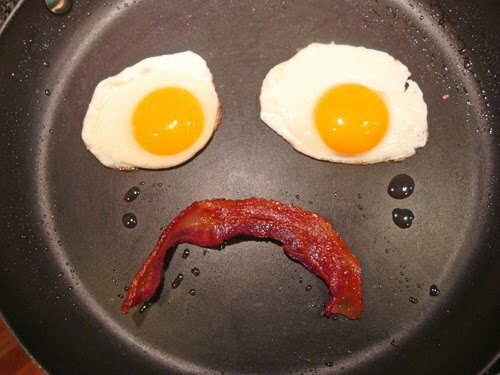 The bacon and egg face is a parody of the frowney face on the cover of the March 26, 1984 Time Magazine. The headline then was: “Cholesterol, and Now the Bad News.” Inside, an article titled, “Hold the Eggs and Butter,” started with the following statement: “Cholesterol is proved deadly, and our diet may never be the same.” The first assertion was false (although the second certainly turned out to be true). In fact, the study that lead to this conclusion was not a diet study at all, but a study of a cholesterol reducing drug. All the previous studies that tried to link dietary cholesterol to heart attack risk had failed. We now have good science that shows why; eating fat and cholesterol actually reduces the amount in the blood. Basil Rifkind, the project director for the study referenced in the 1984 Time article, was quoted as saying he “believed” the research indicated that lowering the cholesterol and fat in your diet would reduce your risk of heart disease. It was a belief, nothing more. (The nine-page article laid out the low-fat orthodoxy that continues to this day. You can read it here: http://www.time.com/time/magazine/article/0,9171,921647,00.html#ixzz1B96rh7k4.) Now, 27 years later, we are still burdened with the fallout of that belief, but at last, there is some good news to report. The feature story in the February, 2011, Reader’s Digest is an interview with Gary Taubes that covers some of the main points from his new book, Why We Get Fat and What To Do About It. According to Taubes, if the energy balance system (calories in verses calories out) determined how much we weigh, we would all be fat, because it is impossible to precisely regulate calorie consumption. Being off by just 20 calories a day would add up to a twenty pound weight gain every ten years and most of us would be obese by the time we reach middle age. Twenty calories is about the amount in one bite of a hamburger or two sips of Coke. 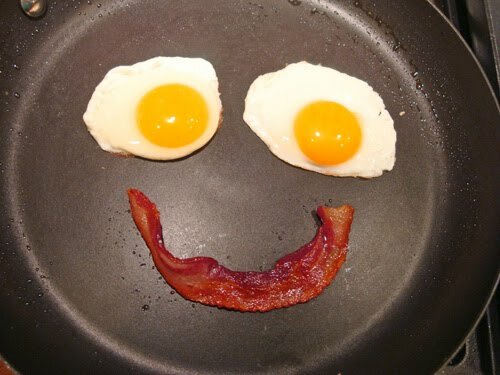 I made the bacon and egg faces above for breakfast this morning. Join me in celebrating what the Reader’s Digest calls the new science of diet by making your own bacon faces. Snap a picture and stick it up on the fridge where it can make you smile as you prepare your now officially healthful breakfast. Better yet, e-mail it to me and I’ll post it here. Bacon and eggs, Gary Tuabes, Jeff Volek, New science of dieting, Reader's Digest. Bookmark. I just got back from Washington where I was trying to make the case for congressional intervention in some way in the nutrition business. At least one congressional aide was impressed with the Readers Digest cover that I brought along. I made the point that this popular exposition means that there is an opening for changing things without stepping on too many toes. Your readers might also want to contact their own elected officials. To ask for: hearings or presentations by people who know the low-carb story (the Nutrition & Metabolism Society can supply physicians and scientists) and government officials can ask the USDA, NIH about their positions and the direction of their funding history. Not as challenge but — and this was the congressional aides point — why policy has not kept up with science, science that is intelligible to the average citizen. An interesting side-light: the newstand in the subway did not carry Readers Digest but the newstand guy said that he remembere it — his father used to read it. I did get a copy at the Amtrak station. One of my contacts in Washington also remembered it. His Dad used to read it too. The magazine itself says that it is still "the widest read magazine in the world." That may mean foreign editions or it is in more doctors' waiting rooms. Anyway, it makes we want to get people to subscribe — right after they become members of the Nutrition & Metabolism Society (http://www.nmsociety.org). Have I mentioned that idea before? Turns out you can subscribe for $5. Of course, it is a popular magazine and the next issue may be about how you need vegetable sources of food but they might get the idea they covered the right subject. Thanks for the suggestions, Dr. Feinman. We can also send letters to the editors of Reader's Digest to show our appreciation.